A waterspout was spotted near the Bay Bridge in Maryland on Saturday. 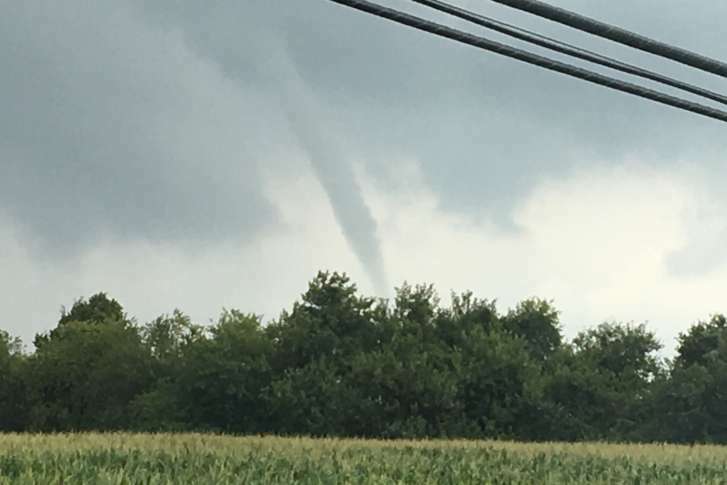 "Waterspouts tend to look menacing but are usually very weak if they make landfall," WTOP's Dave Dildine said. WASHINGTON — A waterspout was seen between the Bay Bridge and Kent Narrows on Saturday. The sighting prompted a tornado warning, which was canceled shortly after. The whirlwind was initially reported by the coast guard around 11:30 a.m., according to the National Weather Service in Mount Holly, New Jersey. “Weak, spindly waterspouts over the Chesapeake Bay are not uncommon during the summer months,” he said. In July 2015, some waterspouts were observed south of the Bay Bridge. They caused a stir on social media but didn’t damage anything. Some drivers on the Eastern Shore between the Bay Bridge and Kent Narrows stopped along the roadside to watch the waterspout churn over the water but the storm otherwise had a minimal impact on traffic. After the whirlwind dissipated, heavy rain moved across Route 50 near Queenstown. Bay Bridge authorities briefly blocked the reversible lane on the west span of the bridge but that is a standard practice whenever it’s rainy or windy. Watching a waterspout from the Bay Bridge was probably an unnerving sight for some drivers, but no crashes or other mishaps were reported other than the usual slow Saturday beach traffic. WTOP’s Dave Dildine contributed to this report.